Therapeutic options for patients with non-small cell lung cancer (NSCLC) are often restricted to systemic chemotherapy. However, the molecular and cellular processes during chemotherapy of advanced NSCLC patients still remain unclear. Here we investigated the stimulatory activity of plasma in advanced NSCLC patients and its correlation with chemotherapy. Whole blood samples from advanced NSCLC patients were collected before the first, second, and third cycle of chemotherapy. Plasma was isolated following centrifugation of whole blood. PBMCs were isolated from whole-blood specimens by Ficoll-Hypaque density gradient centrifugation. Immune complexes (ICs) were isolated from NSCLC plasma using the IgG Purification Kit. qRT-PCR was used to detect a broad array of cytokines and chemokines. The plasma in advanced NSCLC patients was endowed with stimulatory activity and capable of inducing proinflammatory cytokines. Both nucleic acids and immunoglobulin components were required for the stimulatory activity of NSCLC plasma. In consistent, TLR8 and TLR9 conferred the stimulatory activity of plasma in NSCLC patients. Of note, we revealed the decreased stimulatory activity of plasma in patients who responded to chemotherapy. 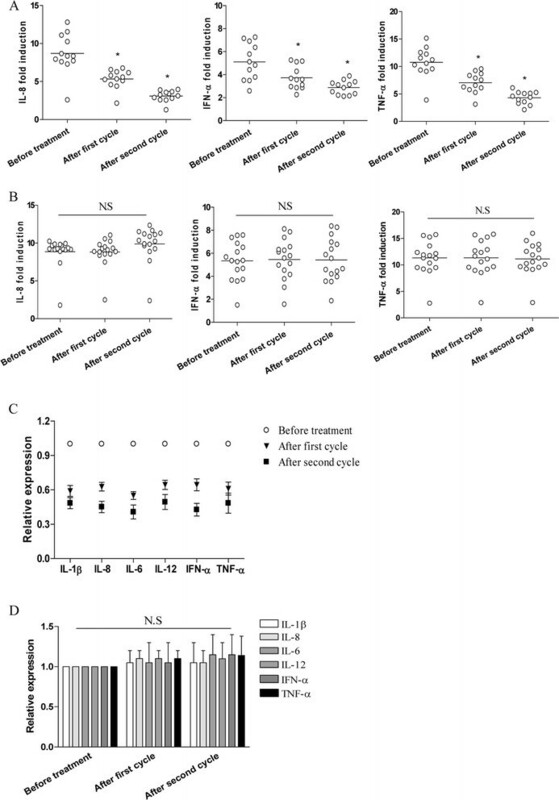 Our findings demonstrated that the plasma of advanced NSCLC patients required TLR-stimulating nucleic acid immunoglobulin complexes and could discriminate the responsiveness to chemotherapy, which might provide a novel mechanism by which the proinflammatory immune response was induced and a potential new biomarker for evaluating responsiveness to chemotherapy in NSCLC patients. Lung cancer is the leading cause of cancer-related death worldwide . Approximately 85% of lung cancers are non-small cell lung cancer (NSCLC), most of which are only diagnosed at advanced stages when therapeutic options are often restricted to systemic chemotherapy –. However, chemotherapeutic treatments for NSCLC are still relatively ineffective . A better understanding of the molecular and cellular processes during chemotherapy of advanced NSCLC patients was urgently needed. Recent study revealed the presence of endogenous nucleic acid-immunoglobulin complexes in the plasma of cancer patients . It has been known for some time that endougenous nucleic acid-immunoglobulin complexes could induce the proinflammatory responses efficiently –. Accumulating data showed that the plasma proinflammatory cytokines were associated with the progression of NSCLC in patients ,–. These studies implicated a potential stimulatory effect of plasma in NSCLC patients. However, the stimulatory effect of plasma in advanced NSCLC patients and its correlation with their response to chemotherapy still remain unclear. Here we reported that nucleic acid-immunoglobulin complexes in plasma from NSCLC patients could effectively induce proinflammatory cytokines through Toll like receptor (TLR) 8 and TLR9. We revealed a reduced stimulatory activity of plasma in patients who responded to chemotherapy. Our findings provided a novel mechanism by which the proinflammatory immune response was initiated and propagated and a promising new method for discriminating the response to chemotherapy in advanced NSCLC patients. To detect whether the plasma of NSCLC patients was endowed with stimulatory activity, we detected the proinflammatory cytokines generated from PBMCs of healthy controls following exposure to plasma collected from the NSCLC patients prior to chemotherapy. We found that the NSCLC plasma was effectively to induce the production of cytokines including IL-1β, IL-8 IL-6, IL-12, IFN-α and TNF-α (Figure 1A, P < 0.05). In contrast, exposure of normal PBMCs to normal plasma or to control plasma resulted in no significant generation of proinflammatory cytokines (Figure 1A, P > 0.05). Consistently, we analyzed the expression of cytokines in PBMCs isolated from NSCLC patients prior to the treatment, and found that the expression of cytokines in PBMCs was higher in NSCLC patients than that in healthy controls (Figure 1B, P < 0.05). The plasma of NSCLC patients was endowed with stimulatory activity. (A) PBMCs derived from normal volunteers were cultured in the presence of 20% plasma derived from normal donors or from NSCLC patients before treatment, or control plasma (20% fetal bovine serum). Data points represented individual patients. 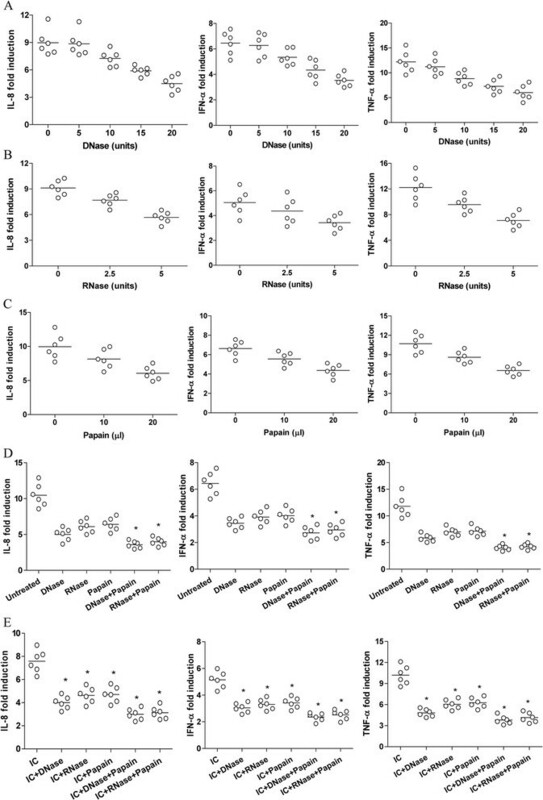 *P < 0.001 (B) PBMCs derived from 16 normal volunteers or from 28 NSCLC patients were tested for the expression of the indicated cytokines using quantitative PCR. *P < 0.001. Each bar represented the means (±SD) from 16 normal volunteers or from 28 NSCLC patients. When plasma from NSCLC patients were pretreated with DNase or RNase and then incubated with the normal PBMCs, as shown in Figure 2A and B, we found that pretreatment of plasma with DNase and RNase could significantly abrogated the induction of IL-8, IFN-α and TNF-α in a dose dependent manner (P < 0.05), suggesting that nucleic acid was crucial for stimulatory activity of NSCLC plasma. Further, pretreatment of plasma with immobilized papain could also inhibit the induction of IL-8, IFN-α and TNF-α in a dose dependent manner (Figure 2C, P < 0.05), suggesting that the immunoglobulin (Ig) component was also important for the stimulatory activity of NSCLC plasma. Besides, when normal PBMCs were incubated with NSCLC plasma pretreated with DNase plus papain or RNase plus papain, the induction of IL-8, IFN-α and TNF-α decreased further (Figure 2D, P < 0.05). These data indicated that nucleic acid-immunoglobulin complexes in plasma might be responsible for the stimulatory effect of NSCLC plasma. Indeed, when normal PBMCs were incubated with ICs isolated from the NSCLC plasma prior to chemotherapy, as shown in Figure 2E, we observed an significant expression of cytokines, which could be abrogated by pretreatment with DNase, RNase and papain (P < 0.05). Nucleic acid and protein in plasma were required for their stimulatory activity. (A-C) PBMCs derived from normal volunteers were cultured with 20% plasma derived from NSCLC patients before treatment in the presence of the indicated dose of DNase, RNase and Papain respectively. (D and E) PBMCs derived from normal volunteers were cultured with 20% plasma derived from NSCLC patients before treatment (D) or the isolated immune complexes (IC) (E) in the presence of the of DNase (20units), RNase (5units) and Papain (20 μl) respectively. *P < 0.01. Data points represented individual patients. We then explored the potential role of TLRs in induction of cytokines by NSCLC plasma using human embryonic kidney (HEK) cells transfected with TLR3, TLR4, TLR8, and TLR9 respectively. We found that 4 of 5 NSCLC plasmas effectively induced the expression of IL-8 in HEK cells transfected with TLR8 and TLR9, which could be enhanced by co-transfection with CD32 (Figure 3A and B, P < 0.05). These data suggested that TLR8 and TLR9 were required for the stimulatory effect of NSCLC plasma. To confirm these results, normal PBMCs were transfected with shRNA targeting TLR3, TLR4, TLR8 and TLR9, and then stimulated with the NSCLC plasma collected before chemotherapy. As shown in Figure 3C, we found that transfection with shRNA effectively down-regulated their mRNA expression respectively (P < 0.05). Of important, transfection with shRNA targeting TLR8 and TLR9, but not TLR3 and TLR4, significantly inhibited the induction of IL-8 (Figure 3D, P < 0.05). Finally, we confirmed that ICs isolated from the NSCLC plasma could effectively induce the expression of cytokines through TLR8 and TLR9 but not TLR3 and TLR4 (Figure 3E and data not shown). TLR8 and TLR9 conferred the stimulatory activity of plasma of NSCLC patients. (A) HEK cells transfected with TLR3, TLR4, TLR8 and TLR9 were incubated with 20% plasma from NSCLC patients before treatment for 6 h, and then assayed for the expression of IL-8 using quantitative PCR. Negative controls were HEK transfectants stimulated with plasma from normal adult volunteers. Positive controls were HEK transfectants stimulated with TLR agonists. (B) TLR8 and TLR9-expressing HEK cells were co-transfected with CD32-expression vector and then stimulated with 20% plasma from NSCLC patients before treatment for 6 h. *P < 0.001. (C and D) PBMCs derived from normal volunteers were transfected with the indicated TLR shRNA respectively for 24 h, and then cultured with 20% plasma derived from NSCLC patients before treatment for 6 h. The efficacy of TLR shRNA was evaluated by detecting their relative mRNA expression. *P < 0.01. (E) HEK cells transfected with the indicated TLR with or without CD32 were incubated with the isolated IC from NSCLC plasma before treatment for 6 h. *P < 0.001. Data points represented individual patients. Each bar represented the means (±SD) from 5 NSCLC patients. When we analyzed the stimulatory activity of NSCLC plasma in the responders and nonresponders of advanced NSCLC patients to chemotherapy, as shown in Figure 4A, we found that exposure to NSCLC plasma from responsive patients before the second and third cycle of chemotherapy resulted in a decreased induction of cytokines in normal PBMCs. In contrast, plasma isolated from the nonresponders before the first, second and third cycle of chemotherapy induced a generally comparable level of cytokines (Figure 4B, P > 0.05). These findings indicated that the plasma from responders exerted a reduced stimulatory activity. In consistent, we found a decreased expression of cytokines in PBMCs of responders after the first and the second cycle of chemotherapy (Figure 4C, P < 0.05). The expression of cytokines in PBMCs of nonresponders was generally comparable during the first and second cycle of chemotherapy (Figure 4D, P > 0.05). Reduced stimulatory activity of plasma in patients who responded to chemotherapy. (A and B) PBMCs derived from normal volunteers were cultured with 20% plasma derived from NSCLC patients who responded to chemotherapy (A) or not responded to chemotherapy (B) before treatment, after the first cycle and after the second cycle of chemotherapy respectively. Data points represented individual patients. *P < 0.01. (C and D) PBMCs derived from NSCLC patients who responded to chemotherapy (C) or not responded to chemotherapy (D) before treatment, after the first cycle and after the second cycle of chemotherapy respectively, and then assayed for their expression of the indicated cytokines. Each bar represented the means (±SD) from 12 responders or 16 nonresponders. The discovery of a series of innate immune-specific receptors activated by pathogen associated molecular patterns led to a new understanding of innate immunity mechanisms ,. Among the innate immune-specific receptors, the best characterized are the Toll like receptors (TLRs), which are primary identified mainly on cells of the immune system, and play an essential role in adaptive immunity –. Recently, accumulating data suggested that TLRs were involved in the development of antitumor immunity –. In lung cancer patients, accumulating evidence suggested that TLR9 signaling played a crucial role in anti-tumor immunity –. However, TLR9 response to CpG oligonucleotide (ODN) in human lung cancer cells could also enhance their growth and invasive potential in vitro and in vivo –. Besides, TLR9 signaling could increase the release of VEGF in a mouse model of lung cancer . Therefore, the potential role of TLRs in tumor immunity was complex and still deserved to be elucidated. Our current study showed that NSCLC plasma could induce the proinflammatory cytokines. Of note, TLR8 and TLR9 signaling contributed to the generation of proinflammatory immune responses in advanced NSCLC patients. In addition, NSCLC plasma effectively induced expressions of pro-inflammatory cytokines from autologous NSCLC PBMCs (Additional file 1: Figure S1). Our findings were consistent with previous studies, which showed that the nucleic acid-immunoglobulin complexes were effect to induce immune response and thus played crucial roles in autoimmune disease and antitumor immunity ,, and provided a novel insight into the production of proinflammatory cytokines in NSCLC patients. In present study, we revealed a reduced stimulatory activity of plasma in NSCLC patients who responded to chemotherapy. Our data were in line with previous evidence which showed that high levels and insufficient decreases of nucleosomes during the first cycle of chemotherapy indicated poor outcome of NSCLC patients , and the previous study which found that the circulating tumor cells and tumor DNA in peripheral blood was associated with clinical response to chemotherapy in NSCLC patients . Our results suggested that reduced chemotherapy resistance was associated with TLR-stimulating nucleic acid immunoglobulin complexes in peripheral blood of advanced NSCLC patients. However, the precise mechanisms by which the nucleic acid-immunoglobulin complexes were generated and involved in antitumor immunity undoubtedly need successive studies. We should acknowledge some limitations of this study. The clinical sample size in this study was relatively small, and thus, large-scale studies were needed. The precise mechanisms by which the nucleic acid-immunoglobulin complexes were generated and involved in antitumor immunity undoubtedly needed successive studies. In addition, the findings should be tested at individual level to further the translational study. Our results suggested that the stimulatory activity of plasma in the form of TLR-stimulating nucleic acid immunoglobulin complexes in patients with advanced NSCLC was associated with their chemotherapy resistance. These findings might provide a novel mechanism by which proinflammatory immune responses were initiated and propagated in NSCLC patients and a potential new method for discriminating the NSCLC patients who responded to chemotherapy. This study was approved by the Ethics Committee of Tongji University. The collection and storage of patient medical information was analyzed anonymously. The peripheral blood samples were collected after obtaining written informed consent. A total of 28 patients with newly diagnosed NSCLC (stages III and IV) without infection were recruited, and all the peripheral blood samples were collected after obtaining informed consent. The clinical characteristics of NSCLC patients were summarized in Table 1. Normal controls (n = 16) were recruited and all were in excellent health at the time of the study. Abbreviations: CMV caboplatin + mitomycin c + Vinblastin, MV mitomycin c + Vinorelbin, GC gemcitabine + cisplatin. The classification of response to chemotherapy was performed as previously described . Before start of the third cycle of chemotherapy, staging investigations were done consisting of clinical examination, whole body computed tomography, and laboratory examinations. The response to therapy was classified according to the World Health Organization classifications defining “remission” as reduction of the tumor volume ≥50%, “progression” as increase of the tumor volume ≥25% or appearance of new tumor manifestations, and “no change” as reduction of the tumor volume <50% or increase <25%. In this study, 12 patients reached remission (42.9%), 11 suffered from progression (39.3%), and 5 had no change of disease (17.8%). The patients with “progression” and “no change” were joined to the group of nonresponders to therapy, whereas patients with remission were classified as responders to therapy. Whole-blood samples were collected before the first, second, and third cycle of chemotherapy for determination of their stimulatory effect of plasma. Plasma was isolated following centrifugation of whole blood. PBMCs were isolated from whole-blood specimens by Ficoll-Hypaque density gradient centrifugation (Sigma-Aldrich). qRT-PCR was used to detect a broad array of cytokines and chemokines, using gene specific sense and anti-sense primers, as previously described ,. 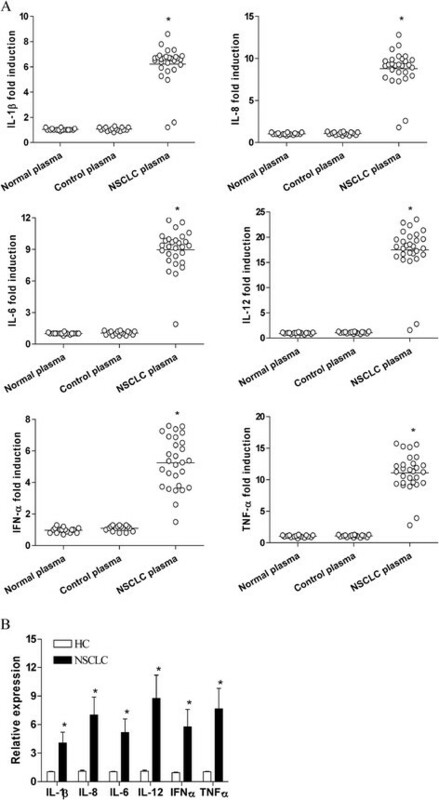 In experiments using PBMCs, PBMCs (2 × 106/ml) were stimulated with conditioned medium containing 20% of NSCLC plasma (vol/vol). Specifically, 1 million cells in suspension were stimulated with either TLR agonist or 20% patient plasma for 6 hours prior to harvesting cells for RNA extraction. In experiments using TLR-expressing cell lines, cells were seeded at 2 × 105 cells/well, rested in RPMI 1640 overnight, and then exposed to either TLR agonists or 20% patient plasma for the indicated time. Exposure to 20% of a single lot of fetal bovine plasma was used as a negative control. Relative quantification of gene expression was normalized against the housekeeping gene GAPDH. Isolation of ICs and treatment of plasma with nucleases and protease were achieved as previously described . Immune complexes (ICs) were isolated from patient plasma using the IgG Purification Kit (Pierce) per the manufacturer’s instructions. To test the role of nucleic acids in the immunostimulatory activity of test plasma, 20 μl patient plasma were treated with 20 units of DNase I (Ambion) or 5 units of RNase (Promega) for 30 minutes at room temperature before stimulation of cells. Protease treatment of test plasma was achieved using 20 μl of immobilized papain (Pierce) for 4 h at room temperature prior to stimulation of cells. HEK293 cells stably expressing human TLR3, TLR4, TLR8, TLR9, and control cells, the TLR agonist as well as the shRNA targeting human TLR3, TLR4, TLR8 and TLR9, were all purchased from Invivogen and used according to the instructions. Data are presented as the mean ± standard deviation from three independent experiments performed in triplicate. T tests were used for statistical analyses using the program PRISM 6.0 (GraphPad Software Inc., San Diego, CA, USA). P < 0.05 was considered to be significant. We thank Professor Qinchuan Li for useful comments and Dr. Yang Han for technical assistance. This work was supported by National Natural Science Foundation of China (81372347,81071744), Shanghai Committee of Science and Technology (11DZ1973801), Science and Technology Commission of Shanghai Pudong New Area (PKJ2009-Y05), Shanghai Pudong New Area Academic Leader in Health System (PWRd2010-01), and Basic Research Program supported by the Shanghai Committee of Science and Technology (11JC1410900). Z X and F W carried out experiments and analyzed data. C W participated in study design, performed statistical analysis and helped to draft the manuscript. X L participated in study design and helped to draft the manuscript. B K, S S, X G and K W participated in doing experiments, data analysis and regents supplies. T R conceived of the study, participated in its design and wrote the manuscript. All authors read and approved the final manuscript.